In this section, we are going to learn PEMDAS rule. This rule can be used to simplify or evaluate complicated numerical expressions with more than one binary operation easily. 1. 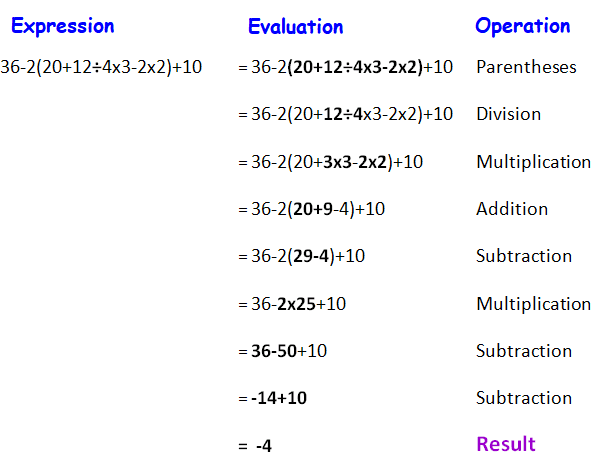 In a particular simplification, if you have both multiplication and division, do the operations one by one in the order from left to right. 2. Multiplication does not always come before division. We have to do one by one in the order from left to right. 3. In a particular simplification, if you have both addition and subtraction, do the operations one by one in the order from left to right. In the above simplification, we have both division and multiplication. From left to right, we have division first and multiplication next. So we do division first and multiplication next. To have better understanding on PEMDAS rule, let us look at some practice problems. After having gone through the stuff given above, we hope that the students would have understood, "Pemdas rule"
Apart from the stuff given above, If you want to know more about "Pemdas rule",please click here.